CPAP therapy is a common treatment for adults and children with sleep apnea. This sleeping condition can lead to a number of health problems as it prevents the sufferer from getting quality sleep. While it may take some time to get used to, a CPAP mask is the best choice of treatment for many people. When used properly, it allows patients to breathe properly so that they can get an entire night’s sleep without any interruptions. 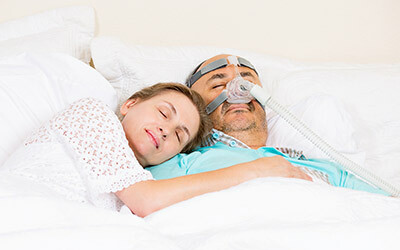 If you have sleep apnea, and are weighing your options for treatment types, here are some reasons why you should consider a CPAP mask. Why You Should Consider A CPAP Mask? It’s designed to blow air into your airway while you sleep. You won’t have to worry about waking up several times a night feeling as though you are suffocating. Whether you are a nose or mouth breather, a side sleeper or back sleeper, there is a mask designed specifically for you. There will be less daytime fatigue and sleepiness. Imagine how much more you will be able to get done at work and home when you are alert and focused all the time. CPAP therapy can restore your normal sleep pattern and give you a big boost in energy throughout the day. When was the last time you woke up feeling refreshed? This type of therapy helps to prevent cardiovascular conditions. Sleep apnea plays a role in the development of conditions such as high blood pressure. Since a CPAP mask prevents apnea, it will reduce the chances of you developing such conditions. Sleep deprivation has been associated with the development of insulin resistance in individuals who are ordinarily healthy. Patients who already have diabetes may find the condition even more difficult to deal with when sleep apnea is untreated. The promotion of emotional well-being is another benefit of CPAP therapy. When sleep disorders are treated, you can get expect to feel a lot better during the day. Your relationships are improved since you are in a better mood. There isn’t as much depression. Memory is also improved. Many people with untreated sleep apnea have problems with their short-term memory and daytime cognitive function. If you experience such problems, you can overcome them with quality treatment. Stroke prevention is an important benefit of sleep apnea treatment. This sleeping condition is particularly troublesome for stroke patients, and increases the chances of having a second stroke considerably. Whether you’re trying to prevent your first stroke or second, CPAP masks are the way to go. It’s important that you begin treating the apnea. It’s not safe to drive or handle equipment when you’re sleep deprived all the time. You lack alertness and focus. This puts not only yourself at risk, but your family if you are trying to drive them around. Handling equipment at home or at work can also be dangerous if you’re feeling groggy and tired. Getting a full night’s sleep is good for you as well as for those around you. Sleep plays a huge role in overall mental and physical health. When you get plenty of it, as you will with the right CPAP mask, you will be improving your health and preventing many complications.